You can also wirelessly share videos with a Wi-Fi enabled TV. The feature relies on DLNA technology to connect and the Miracast protocol for streaming. It's another feature most customs launchers had, but is only now making its way to the platform itself. There's an FM radio on board too. It users wired headphones as an antenna and offers clean, intuitive interface. The stereo speakers of the smartphone offer quality sound even at max volume. They are loud too, though far from the BoomSound setup of the HTC One family. The Motorola Moto G (2014) performance in our audio quality test was a step forward from its predecessor in terms of purity although it wasn't any louder. 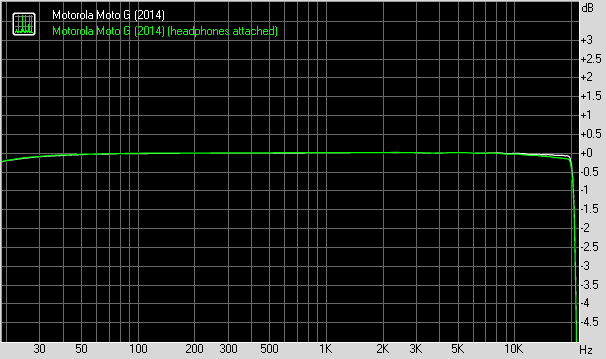 The 2014 version of the handset did show slightly better frequency response as well as get rid of all the distortion. 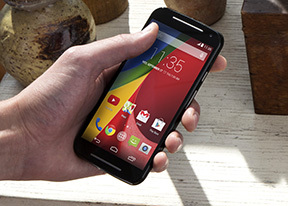 When connected to an active external amplifier the Motorola Moto (2014) showed great dynamic range, signal-to-noise ratio and stereo crosstalk. Its frequency response was also spot on and there was no distortion, leaving the only average volume levels as the only not-excellent bit of its performance. The good news is, besides the extra stereo crosstalk, there's virtually no degradation when you plug in a pair of headphones. The volume levels remained only average here, but that still makes up for an impressively solid overall performance. And here go the detailed results so you can check them out for yourselves.